eBay Powered by Frooition About us Shipping Returns Contact us Our Reviews Promotions Video GamesGame HardwareToys2LifeElectronicsMiscellaneousLast Chance!Under $10 Halo Wars 2 - Ultimate Edition Shop CategoriesVideo GamesXbox OneXbox 360Playstation 4Playstation 3Playstation 2Playstation VitaPlaystation PSPNintendo SwitchNintendo WiiUNintendo WiiNintendo 3DSNintendo DSPC SoftwarePreowned GamesGame HardwareMicrosoft ConsolesNintendo ConsolesSony ConsolesRetro ConsolesControllersHeadphonesStrategy GuidesVirtual RealityOther AccessoriesToys2LifeDisney InfinityLEGO DimensionsNintendo AmiiboSkylandersElectronicsAudioCamerasMobile PhonesPower AccessoriesWearablesOther ElectronicsMiscellaneousApparelCollectiblesToysOther MiscellaneousLast Chance!Under $10 Helpful Links Add to Favorite Sellers Sign up to Newsletter View Feedback Contact Seller Visit seller's eBay Shop About Seller Page Halo Wars 2 - Ultimate Edition Item Description An all-new enemy threatens the Halo universe and the only thing standing between Armageddon and humanity is the brave crew on board the Spirit of Fire. Real-time strategy makes an explosive return to the Halo universe in Halo Wars 2. Lead armies of Spartans and other Halo fighting forces like Warthogs, Scorpions and exciting new units in a brutal war against a terrifying new enemy on the biggest Halo battlefield ever.Features:All-new, Action-packed Story - The heroes of Halo Wars return to find themselves - and the galaxy - in more danger than ever. Following the events of Halo 5, the all-new story is told in action-packed missions set on the legendary Halo destination known as the Ark. Players will strategically command overwhelming firepower in large-scale battles against a terrifying threat facing the UNSC and all of humanity.Build Your Halo Army - Construct your bases, prepare your vehicles and amass your troops. Lead them into huge battles that span across alien environments in a vast collection of campaign and multiplayer maps.Multiplayer Warfare - Play with or against your friends and the Xbox Live community in up to 3v3 matches. All-new units with explosive firepower, Leaders with special abilities that help to turn the tide in battle and thrilling multiplayer modes are at your fingertips as you wage war on a variety of maps.Blitz: Instant Command - Blitz is an entirely new way to experience Halo Wars and real-time strategy gameplay. Combining tactical combat with card-based strategy, your deck is your army in Blitz as you build collections of powerful Halo vehicles and troops and command those units in fast-action matches online or solo against waves of enemies.Ultimate Edition:The Halo Wars 2: Ultimate Edition includes early access to the full game four days before the game's standard release date, Halo Wars 2 Season Pass download code and Halo Wars: Definitive Edition download code.Halo Wars: Definitive Edition - Halo Wars: Definitive Edition is an enhanced version of the real-time strategy classic, Halo Wars, updated to run natively on Xbox One and Windows 10. 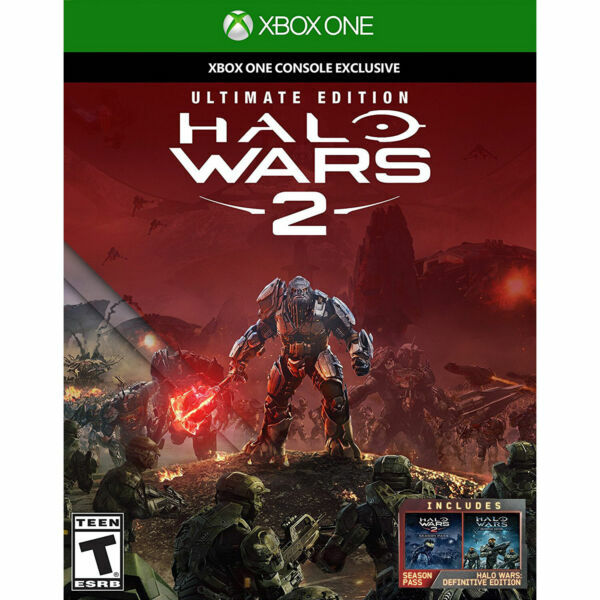 Halo Wars: Definitive Edition includes improved graphics, new achievements and all of the DLC created for the landmark real-time strategy game.Halo Wars 2 Season Pass - Grow your war chest with the Halo Wars 2 Season Pass. The Season Pass delivers regular updates that span more than six months, including: New Leaders with abilities that change the course of multiplayer matches, new Units that add to your multiplayer arsenal, new Blitz cards to collect and take into battle, and new campaign missions that expand the Halo Wars 2 story.Game Variation:Actual product received could be slightly different than what picture shows. To clarify the main photo may show the standard edition but you could actually receive the Greatest Hits, Platinum or a store specific version e.g. Walmart exclusive or Best Buy exclusive. Game Manuals Certain publishers have opted not to include physical manuals. If you do not find a manual please visit the publishers website for a digital version. You May Also Like More Items!View more great items Video Games Game Consoles Accessories Toys 2 Life Last Chance About us Shipping Returns Contact us Our Reviews Powered by Frooition Frooition | No-js Template | eBay design, eBay store design, eBay shop design, eBay template design, eBay listing design (ver:froo_no_js) This listing is currently undergoing maintenance, we apologise for any inconvenience caused.